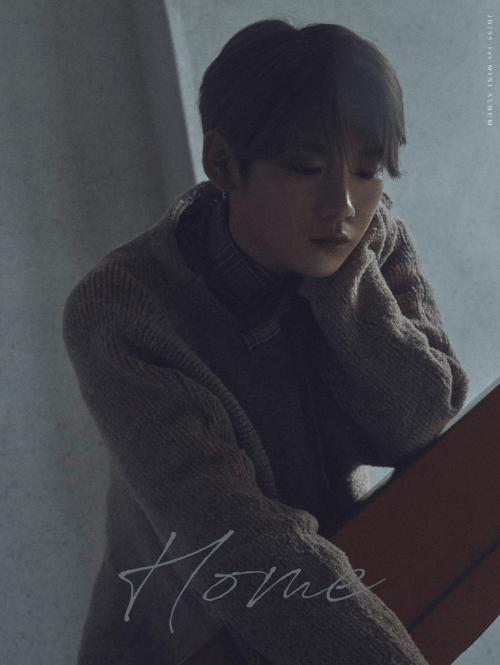 Following their debut schedule, JBJ95 have just released concept photos and album packaging details for their upcoming debut album ‘Home‘. This duo is made up of Kenta and Kim Sang Gyun, who were former members of JBJ. The group disbanded earlier this year after completing activities following the end of season 2 of Produce 101. Hence, this duo was formed. They will be making their debut on October 30th with a debut showcase and MV and album release for ‘Home‘. In the individual concept photos, both Kenta and Sang Gyun hide behind a curtain, so only half of their faces and bodies are revealed. They look cheerful as they smile towards the camera. The atmosphere seems quite dark, but they look bright as the light illuminates them. In the duo concept photo, they are dressed in red, black and white-themed clothes that match each other. They look like the perfect duo as they sit comfortably in a cozy-looking house. In the second batch of concept photos, they have taken a darker stance. The sky looks murky, and the duo stand on top of a roof that overlooks the city, facing away from each other. This suggests that some songs in their debut album will be sentimental and not as upbeat. Even in the individual concept photos, they look solemnly towards the ground. Fans who purchase this album will receive lots of benefits, especially those who pre-order it. Pre-order benefits include a poster and a group photo card. Anyone who purchases the album will receive the CD, a CD box, a booklet, a book-size photo card, a photo card, a transparent photo card, and a bookmark. What do you think of JBJ95‘s teasers so far? Let us know in the comments below!